Hearing that conversation between the pilot and my co-worker mid-flight didn’t make me feel any better. I was on a teeny tiny Cessna plane. A plane so small there were only seats for eight passengers. One of those eight passengers was the pilot. My co-worker was sitting in the seat next to him, when he asked about flying the plane with little to no visibility. My colleagues and I were on our way to a team meeting on Nantucket Island, in Massachusetts. We were supposed to take the ferry over. But the rain was so vicious, the ferry was cancelled. And because the meeting was so “super important,” our boss had us get on that tiny plane instead. A plane where all the passengers had to be weighed before getting on. That was the first time I ever feared for my life. I spent the whole flight praying. Thankfully, my worst fears did not come true. We made it safely onto the island. The plane did not crash. And we did not die. Back when I was noodling over quitting my corporate job, I realized one of the things that was holding me back was health insurance. Even though I was in great shape, I had a pre-existing condition that I knew would make it tough for me to get covered. My fear about all the bad things that could happen made me stay much longer than I should’ve, in a career that wasn’t meant for me. Eventually, I pushed past the fear and made the leap. But unlike that plane ride to Nantucket, my worst fears did come true. I did have trouble getting health insurance. And eventually, I ended up in the hospital. It took months to climb out from the aftermath (that’s a story for a different day, but in case you’re interested, here’s the short version). It can paralyze you. And most of the time, it’s for nothing. Most of the time, the things that scare us are all delusions, and false-limitations we create for ourselves in our minds. On those rare occasions when your worst fears are realized, it doesn’t mean the world has to come to an end. You can bounce back. The good news? When you feel fear, there are often things you can do to minimize the likelihood that the worst will actually happen. That’s one of the things Brian Clark and I chatted about in the latest episode of I Am the One. Brian, CEO of Copyblogger Media, knows a thing or two about facing fear. Being told you have to undergo brain surgery would devastate most people. But Brian went into it with no fear, and came out of it with a whole new outlook on life. “Now fear is a very useful emotion. If there’s a lion around the corner and you’re afraid, that’s a good sign to run. Or someone is trying to hurt you, or someone is trying to hurt your family. In the comments below, tell me about any fears you’ve had when it comes to building your business. What have you done to overcome those fears? I’d love to high-five you for pushing through it, or if necessary support you in making sure fear doesn’t paralyze you or prevent you for moving forward. 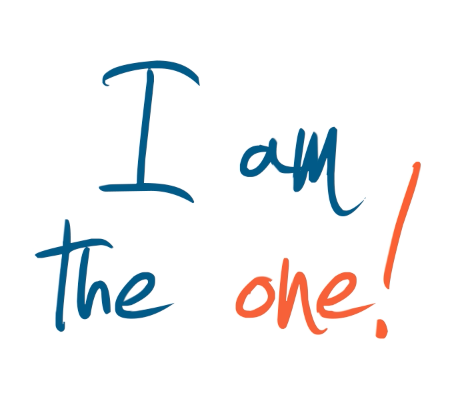 Sonia Thompson: Welcome to episode 2 of I Am the One, a show that features entrepreneurs who decided they were going to be the ones to make life better for the people they serve. I’m Sonia Thompson, and for today’s show, I had the privilege of chatting with Brian Clark, CEO of Copyblogger Media. Brian started Copyblogger in 2006, to teach internet marketing to small business owners. Over the years, the company has expanded into training, software, and other media. With their top notch content, products, and conferences, the Copyblogger Media team has acquired a massive audience of raving fans, that buys more than 8-figures worth of their stuff. So take out your notebook, cause Brian’s got a lot to teach you about how to succeed with your business. Here’s Brian. Sonia: Hey Brian, thanks you so much for joining us today. I’m glad to have you. Brian: I’m glad to be here. Thank you. Sonia: Awesome! I want to just go right ahead and jump right in. Just share with us briefly about your experiences as an entrepreneur, now, of course you’re the head of Copyblogger. But, I’ve heard you mentioned several times that you are unemployable. Can you talk a little bit about what made you unemployable? Give us a little bit about the experiences you had with your first businesses that you started. Brian: Well, I guess 16 years later, it’s because I hadn’t had a job or a boss in 16 years. That is a big part of why I use that word. But even back then, I started as an attorney. I certainly didn’t like the practice of law much. I think that’s valid, but I think I also just didn’t like answering to anyone else, I wanted to do my own thing. It didn’t have to be huge it just had to be within my own control. When I first started, I was really focused on writing as a way to make a living, and it turned out that I was more of an entrepreneur than I thought. I was really interested in starting businesses, but as you know, writing can stay with that the entire time. Truly, a win-win for me I guess. Sonia: What was that first business that you started? Was it something writing related as well? Brian: Yes. My very first business was the only one that failed, and I started out publishing online. It was pure Internet based, it was pure pop-culture of entertainment related, fun stuff for me. I did build audiences, and I did get a little press coverage because back then the Internet, everyone wanted to talk about it, but I made no money, and it wasn’t until when I paired what we now call content marketing, where you had something to sell other than advertising because that was the original plan. The only thing I had to sell was legal services because I was still a license attorney. Rather than starve, I figured I would start a new email newsletter about legal issues related to the Internet, not a lot of attorneys knew anything about that much less talked about it, and it just completely took off. That was my first successful business. After that, I realized how to succeed, but I didn’t want to practice law, so I started a real estate brokerage and another one, really just focusing on OK, whether offline things people want that I can grow into a business using online marketing. Sonia: Then you were able to turn all that you learned from all those experiences in what’s now Copyblogger? Brian: Right. In 2005, I had a life altering, life threatening experience. I had a snowboarding accident that required me to have brain surgery. The short story. After that, I was just not going to do anything business wise that I really didn’t want to do. I knew I had the knowledge and the abilities to operate on my own. That was what I was good at. I was good at content. I was good at marketing. I was good in strategy. I wasn’t that great at running the business that resulted from it. With Copyblogger I grew an audience. I focused on what I’m good at. Then, I partnered with other people to help me do the other things I needed to do. After that you started Copyblogger. Did you approach Copyblogger very differently from your previous businesses based upon that realization? Brian: Absolutely. Instead of going with a safe in-demand service such as real estate brokerage, I just went out and started to build an audience. I had faith that if I paid attention that they will tell me what they wanted to buy. That’s literally the story of Copyblogger. I waited over a year and a half before we’d had any kind of product to sell. Then, we built or created what the audience wanted. That’s what got us into software and the all WordPress base. We continued to grow from there. Sonia: I’m so glad that you did. I’m a happy, proud customer of Copyblogger for years. The things that you guys have produced have done wonders for me. What made you decide that you were going to be the one? You had the experience. You enjoyed content marketing, but what made you decide that you are going to be the one to fill the need that was existing in the market place? Brian: When I originally started Copyblogger, as far as I know the phrase “Content marketing” didn’t exist. I didn’t really start becoming the terminology until 2008. I think all of us reluctantly adopted it, because it’s not the greatest term. But, no one saw of a better one. What I did know in 2005 going to 2006 was that this entire pro blogging or commercial blogging movement was started to gain scene. People were struggling with content creation. Number one. Then, they were struggling with how do you turn on that into business. Those were two things I had figured it out even though I did it on accident and then just did it on trial and error in 1999. But, there were two principles there that I had taught myself: copy-writing, once I figured out that content is way to attract people to sell stuff. Not advertising. The other thing of course, I figured out was that you sell stuff not advertising. Applying copywriting techniques to content, like better headlines, the way you structure your post to be read, these principles of engagement that are part of copywriting. I was the first one to teach that as applied to blogging hence the name, Copyblogger, then other thing of course was, “Look you need business blogging.” You’re selling products and services. You’re really going to have a hard time trying to sell a business of advertising, and I think nine years later, everyone realizes online advertising is hard. Even the ones who get huge amounts of traffic struggle with it. Sonia: It’s part of the process. Now recently, you’ve started a new venture that’s completely unrelated from content marketing and software with Further.net. With all the things that you have going on as CEO of Copyblogger Media, what made you decide to turn your attention to something that’s totally different and in a new field? Go ahead and tell us about Further.net as well. Brian: To answer your initial question, I guess insanity might be the reason? All this time, I’ve never had a personal blog and I’ve always kept it really focused about Copyblogger, the brand, helping the audience and then creating things that help our customers. I’m still obviously leading the company. We’re getting more ambitious not less, but as far as writing about content marketing, I lost steam after I said everything three different ways. You can only do it so much, of course. I’m podcasting, I’m still exploring new issues but I’m also doing it in a way that is personally-driven. Like where is the next level? What’s a new way to do something? The only way that I can really have credibility is to try new things. On one hand, Further.net is my just version of a personal project, it’s not designed at this point to make any money, it doesn’t sell anything. I just want to write and these are the things I’m interested in. The reason I took a curation approach or really linking to other pieces of content and other ideas and stuff like that is, I’m not trying to be the authority figure here, I’m just learning and sharing. It’s like we are going on the journey together and I really love that, because there is no pressure, it’s fun, and I enjoy doing it. At the same time, a lot of people are interested in content curation. It does relate to the day job and to the Rainmaker Platform, which is built on all that good stuff. But, other than that, I just love doing it, it’s a blast. Sonia: That’s awesome. Now, I’ve heard you mention before, maybe you must be experiencing with your new project. But, whenever you feel fear, that means that the thing that’s making you fear follow something that you cannot do. You actually have to move forward with it. How do you actually get over that paralysis? That fear makes a lot people to do nothing. How do you get over it to move forward, to go forward with the project? Who knows but regardless, but going back during my early days as an entrepreneur, and even the four years that I practiced law, I was just kind of frozen and didn’t know what to do. You’re trapped by your own fear, mainly fear of failure, what are other people going to think, all of these kinds of stuff. Now, fear is a very useful emotion. If there’s a lion around the corner and you’re afraid, that’s a good sign to run. Or someone is trying to hurt you, or someone is trying to hurt your family. But, most of the things we fear are not like that. They’re not really true things that can harm us physically or endanger our lives or something like that, and yet we have the same exact response, that paralyzing fear and anxiety about it. I guess part of my development over time is when I feel that and it’s not a lion or someone trying to beat me up or something like that, then I need to conquer that because the consequences of being afraid or the worst thing that can happen, it’s generally not that bad. The things I try and mess up, I always learn from them. I always come out stronger by doing it, and then other things are just insecurity. When I started speaking originally back in, I think, 2007, I had no intention of doing that when I started that blog. I wanted to start a blog so I don’t have to leave the house, but even though I’d been an attorney I had a fear of public speaking so I said yes. I just went up there and did it. It’s just a personal creed. I don’t think I’m any braver necessarily than anyone else. Courage is really just maybe being afraid and doing it anyway. That’s how I grow as a person or at least try to. Sonia: Got it. Is there anything that you do to get you more comfortable with the process of overcoming or conquering your fear aside from just getting up and doing it? Brian: Yeah, insane amounts of research and preparation to a certain degree. I never took that approach really to speaking, like I prepare and I know what I’m going to say but I’m not a heavily rehearsed speaker. I just have to know what I’m talking about, go up there and be comfortable that it’s going to be OK. Anything we do with regard to the company or even the newsletter, which I read a lot, I research a lot, I watch a lot, I listen a lot. Then when it’s time to do whatever, you’re just prepared. It never goes the way you think it’s going to go necessarily, but if you know your stuff and you’ve done your preparation and you’ve done the work, you can adapt pretty quickly. Sonia: That’s true, absolutely. Through all your years of experience running businesses, starting new ones, starting new projects, what has been your biggest lesson learned? Brian: From the beginning, it’s what’s in it for other people. No matter how much you want to succeed or how much you think something is cool, you’re either going to live or die on that. Whether you are meeting the needs or satisfying the desires or solving the problems of people out there. That can be your content. That can be your products and services. It’s just a hard lesson for some people to learn because we hear the stories about things like Twitter. Who knew that would work? The thing is, they didn’t know it was going to work, they were all experienced entrepreneurs. They got funding. People would listen to what they would say and it just happened to work. Instagram, it makes no money and it’s bought for a billion dollars. That’s not reality though. Reality in most businesses, 99.9 percent of them are not those stories. It’s simple hard work, understanding what people want and giving it to them in a new way that feels unique and human, I guess, is probably the biggest difference these days. Sonia: All right. That’s true. I guess that’s probably what a lot of people struggle with in entrepreneurship, they feel like they need to take a lot of safe routes. That’s probably what makes them most invisible or what makes it the biggest challenge for them as they’re doing the same things that everybody else is doing. Brian: Yeah, that’s the flip side of it, just because you’re satisfying an existing need or desire doesn’t mean you don’t have to be unique and differentiate yourself some way. That’s marketing 101 and that’s the thing people forget. Instead of being themselves, they try to speak in a bland safe way like a corporation. That’s what the corporations are struggling with. Why would you mimic them? As small business owners and entrepreneurs, sometimes us, is the key differentiator. It’s what makes us stand apart. Even though we’re talking about the same stuff or maybe we’re providing a similar service, no one is going to replicate you. Unless you are just a horrible person, which some people probably need to maybe get a different front person. In most cases no, not at all. Sonia: Is there anything that you would change over the past 10 plus years of working as an entrepreneur? Is there anything that you would change if you had the ability to go back and do something over again? Brian: Of course, absolutely. Too many things to really list, although I’ll say the mistakes are what led to the correct decisions in many cases. I’m just a better adjusted person now than I was even four years ago, much less 10 or 15. That’s my own personal journey. I wish I was as calm, confident and able to always make the right decision especially when it comes to people online like to mess with you a little bit. There are better ways than others to deal with that. Overall, you can’t really say you change anything because you wouldn’t be where you’re at right now if you didn’t go on that path. Sonia: That’s true. That’s true. Are you able to boil down your keys to success in three words? I know a lot of times a lot of people have trouble making it into just one. If you had to say that there are three things that were keys to your success, what would they be? Brian: Number one is generosity. Give people something before you ask in return or even make an offer, just builds trust. It attracts people to you in the first place, that’s really one of the foundational reasons why content marketing works. You’re solving one part of a problem for someone before you say “Hey, here’s the rest of it,” right? The other thing is of course we’ve already touched on focus on their problems, their desires, their needs. Let’s say, hard work at the end of day. I got a great team now. I work just as hard because I love it. It does get easier depending on what you’re trying to accomplish. There are many ways in which Copyblogger could have more of a lifestyle business instead of trying to make it to 10 million and beyond. We just chose not to do that because we wanted to do something else. It truly is driven by passion not money, because there’s lots of ways to make money. I think that’s a fourth thing. Anyone I guess can fake it and make it but if you really care and you can make that match up, and you do the work anyway but it just so happens that people pay you money to do that work, then that’s a total win. Sonia: Absolutely it is. What can we expect to see from you in Copyblogger Media or Further.net in the future? Brian: With Further, I’ve got some plans that I’ve already kind of revealed on the Rainmaker podcast that I do every week. For Copyblogger, we got really big plans. A lot of them are centered around the Rainmaker platform that was released last year. That’s the all-in-one hosted website, and soon to be marketing automation platform. We just launched a pilot of a reseller program for that. Designers, content creators, consultants, can take that website development headache out of it by using Rainmaker. We’re launching, we’re actually turning Rainmaker.fm, which is the name of my podcast right now. That’s a bigger thing. That’s actually going to be a podcast network. We’re narrowly known at Copyblogger for teaching people how to write, text heavy, and copywriting heavy. To grow the audience further, we need to build another authority site, and this one built on audio, which as you know, really took off last year. It’s really an amazing format, even for people who prefer to read, because you can’t read while you’re working out at the gym. You can’t watch video while you’re driving a car. Audio is this on-demand, portable, it’s really perfect for educating busy business people. We think that’s our path forward, of course, Copyblogger will keep growing, and chugging along, but it’s time to have another format. As you and I are sitting here talking, right now, many people are going to be able to listen to this while they’re doing something else, on the go, what have you. We see that as a big thing, for 2015, for us. Sonia: That sounds very cool. I’m excited to see all the new things that you guys have coming out on there. It’s going to be very helpful. Sonia: If I can have one more little bonus question for you. Actually, before we do that, any other last parting words for entrepreneurs who are working on their business now, or who are thinking about starting one? Then people are completely unprepared. You have to do your upfront work. You have to do your research. You have to understand what you’re trying to accomplish, but then you have to not be paralyzed by continued analysis. I did that. I did that for four years, in the ’90s. That’s one thing I’ve shaken off. I think things through a crazy amount, but once I decide, it’s either no or yes. If it’s yes, we’re all over it. Sonia: Going back to the bonus question. I always think that what people listen to, their music choices, tells a lot about them. If we were to find you at a karaoke night, what song would we most likely be seeing you up there doing? Brian: That’s a trick question. We just had our company meeting, so we’re about 50 people, but we’re all over the place, US, Canada, Brazil, Europe. We always get together at least once a year in one place, which is always a lot of fun, and we always have karaoke night. I refused to participate in karaoke, although some of our people have some talent, let me tell you. I was not aware. That is a hard question, because I am almost a snob on the range of musical tastes that I have. When I was in the ’80s, when I grew up, I listened to everything from R&B to early rap, to goth punk, what was called alternative. If it wasn’t top 40, I was listening to it. That’s exposed me to so many things, including jazz. Back to the karaoke thing. If I thought I could sing, which I’m pretty sure I can’t, there’s a song by Stone Temple Pilots called “Plush” that is like one of those great sing-along songs like when they perform it in concert the whole audience sings along. I would sing that song. Maybe I should just get some lessons, and sing that one song. I’ll give it a shot. Sonia: You should just do it. Absolutely! Absolutely! Brian, this has been great. Thank you so much for taking time out of your schedule to come and chat with us. Lots of really great pearls of wisdom in here that have been super helpful. Brian: Thank you so much for having me. How will you conquer fears you have for your business? Sonia: Brian had lots of great stuff to share. And one thing I’ve been noodling from what he talked about, is the notion of facing fear. Most things aren’t as awful as we make them out to be – so it’s just a matter of facing our fear and finding a way to get comfortable enough to move forward. So the question I have for you is, what is it about building your business that makes you most fearful? What’s one thing you can do to get prepared to put yourself in the best position to conquer that fear? Think about it, and then put your answer in the comments. Then we can all support each other in giving fear the finger. If you liked this video, go ahead and subscribe to the channel. And I’d be ever so grateful if you shared it with your friends. Until next time, keep working on building your dream business so you can make life better. Somebody’s waiting on you. I love the point that Brian made about generosity. I sometimes worry I’m giving away too much, but this strengthens me in my belief I’m on the right track. We can’t really give away too much, can we? Hey Henneke – we sure can’t. I suppose generosity is a lot like love. The bucket well never goes dry! And generally, the more we give, the more we have to give away. It’s true, what we fear comes true at times. Because, what we think, we create — thoughts are energy which we send to the atmosphere. I’ve travelled in a plane only twice, and I feared a lot, the first time. It was like having the final journey. Fears are most of the times for nothing, but they’re also due to past experiences sitting deep inside our sub-conscious. Yes, I’m talking about past births. Hey Raspal – I so agree. Our thoughts are energy. All the more reason to guard our thoughts closely, so we put the right energy out there. I am so glad that I connected with you and your blog Sonia. Great interview. Brian is such an ordinary guy. Real guy giving real information. Great interview also… Now I see that your writing style and your interview style are equally comfortable. Would love to do some work with you one day. Hey Kelly – I’m happy to be connected with you too! A lot of times we romanticize people who are super successful, when most of the time, they are regular people just like me and you.